Ever since Alfred Watkins coined the term ‘ley lines’ in the 1920s and proposed that the lines connecting ancient sites are in fact old routes followed in prehistoric times for religious or trade reasons, there have been those who have attributed magical energies to leys which they maintain were understood by our ancestors but are now lost to us. In this, her first novel, Sam Osman draws upon these theories to create this engaging mystery adventure. In Quicksilver, Thornham, once a prehistoric site and now a London suburb, has a ley line that runs through the sweetshop, home to Wolfie and his single parent mum, and on through the vicarage where refugee Zi’ib has been taken in. Another key line runs to the ivy covered house where American Tala now lives after her father disappeared. As well as all having green eyes with yellow flecks it transpires that the three children share a birthday (they are all 12), all three have an absent parent and – as they discover – they all have an ability to tune in to the mysterious forces that run along the ley lines. Is their destiny being controlled by these forces and is it for good or bad? Will they find their missing parents? 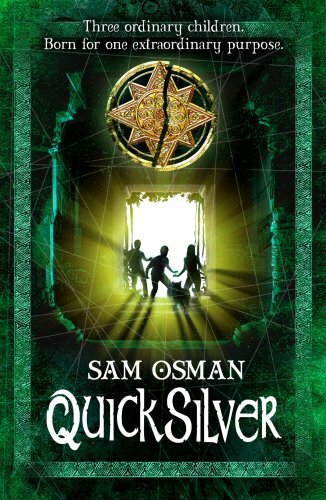 Osman sets a good pace with lots of cliffhangers in this story in which the trio start to use their unusual powers as they turn detective. It is peopled with stock characters (an amiable vicar, an eccentric historian, a French teacher straight from ’Allo, ’Allo!) and has many agreeable moments of slapstick humour; its unpretentious style and straightforward narrative will carry young readers along as they get caught up in the fun. A welcome debut.